ATR #142 – End of the year spectacular! Year end spectacular with Mike Ward and Tim Hall! 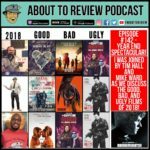 We discuss the good, bad, and ugly films of 2018!